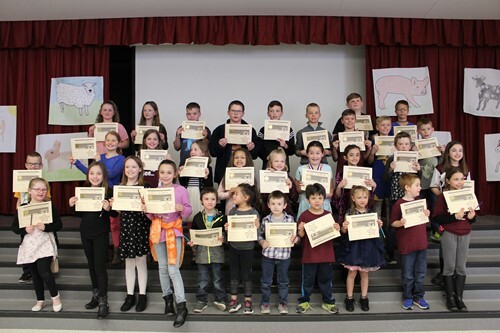 On Friday, March 29, the Elementary School assembled to celebrate the Students of the Month and learn about agriculture education. After cheering on their classmates chosen as Students of the Month, the school enjoyed a presentation from Mr. Parnapy and two members of the FFA. They visited from the High School to explain the activities the FFA takes part in and encourage incoming 7th graders to join next year. Then, the 4-H Club took the stage to describe their activities with animals. The staff helped illustrate the presentation by dressing up as various animals. Several 4-H members capped off the presentation with a kazoo serenade and dance. The Byron-Bergen House band featured some special student musicians who serenaded the audience with a rousing rendition of Old McDonald as students left for their classrooms.